The sofa as it came to us. I am skipping all the work Mitchell has performed doing proper conservation work, reparation of the frame, and going to the finish, because people think this type of finish is the easiest one. WRONG. Give me a good shellacking to do any day! This is a European Pear wood, Louis XVI, French Empire Sofa from the mid-18th century. The image above is the way it appeared when it arrived in our studio. we did not concern ourselves with historical accuracy. After, less overall paint and more pearwood showing. 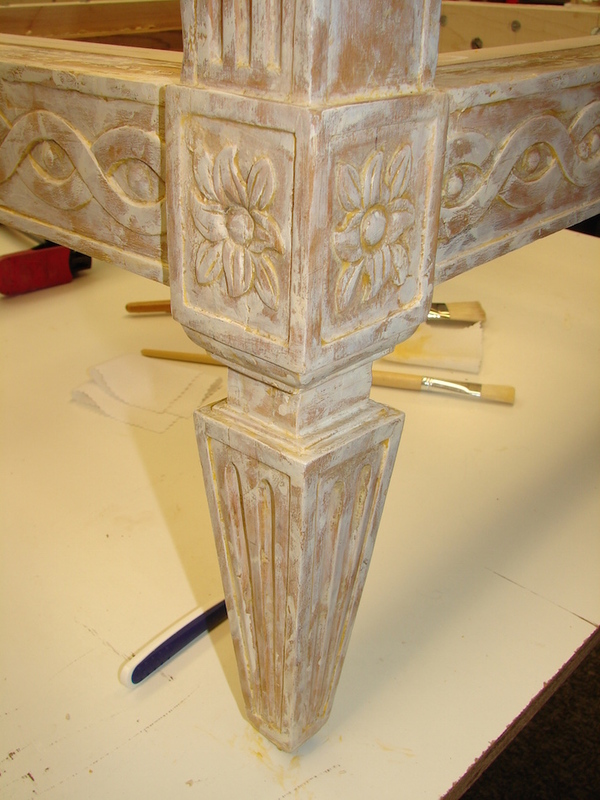 By far one of the most difficult jobs I have is creating the look of an old randomly worn painted finish. On this sofa, I was to recreate the look of two previous paint jobs which had been subject to chemical strippers decades before, while still upholstered. 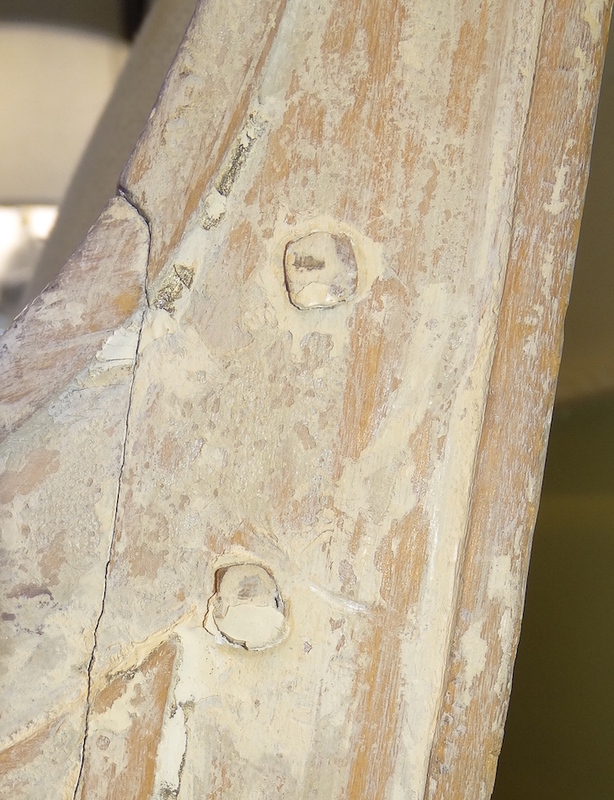 We assume the restorer realized his/her mistake, and left the clabbered, shriveled, accreeted paint shedding from the reliefs and carving everywhere on the decorative frame, shown above. had developed a beautiful patina where it was exposed. which literally was falling off the sofa with any handling. A random pattern is not creating the look of paint worn — paint tends to wear off quite predictably, along edges and where it might bump the wall, or where heels kick it. But a random pattern where the paint was supposed to have fallen off… argh! “Original” finish created by the client’s family, which I was to reproduce. Areas hidden where mahogany infill was apparent. with many layers of color? DIYers are taught it is a wipe job with a crinkled rag, but it is much more complicated. and also allow for the oxidized pear wood to shine through. 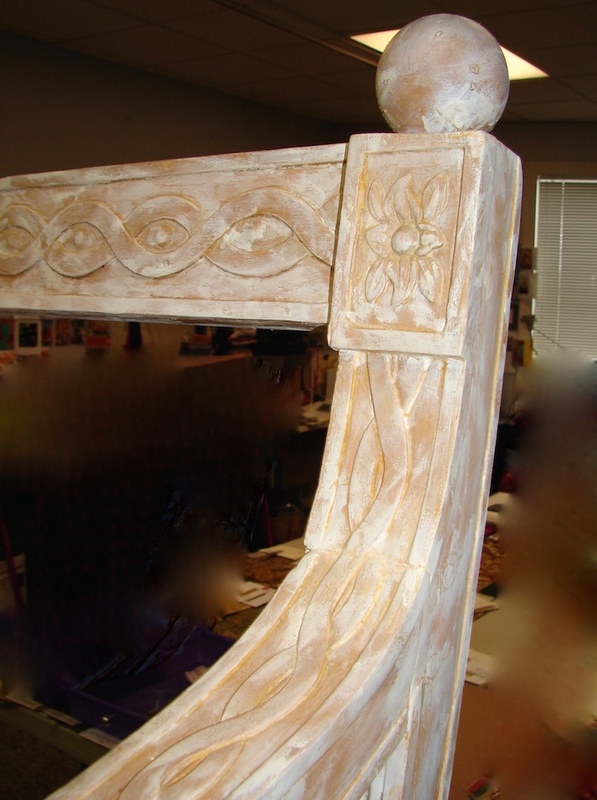 Because it was upholstered incorrectly previously, parts once hidden were visible again. of the frame then matching them against the same images you see here. In the end there were three colors that made up the finish on the frame. Then finding the values I needed over the entire sofa. How we matched to the itty bitty strip of color. job was done by hand and with a scratchy old #4 round paintbrush. Mixing greens, though my first choice was in fact the best. It has to be tested and left to dry on the frame. 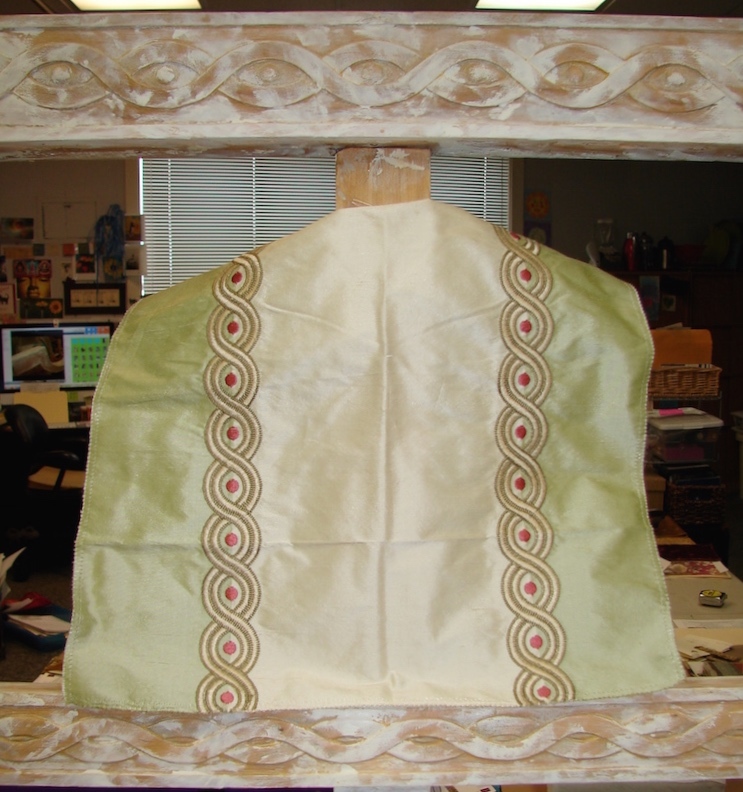 After, and you can see the balancing act of areas that had to be covered versus the random patterning my client wanted. The overcoat of “white” was really Olive Green and Titanium White. then moved to balance that coverage randomly on the rest of the frame. 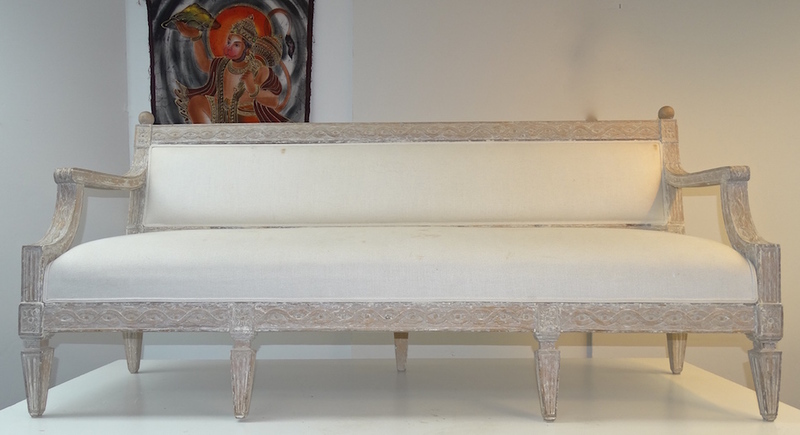 Finally, a slightly yellow wax with beeswax/carnauba/mineral spirits was created to coat the paint after it was fully cured, and to influence the final color of the sofa, above. 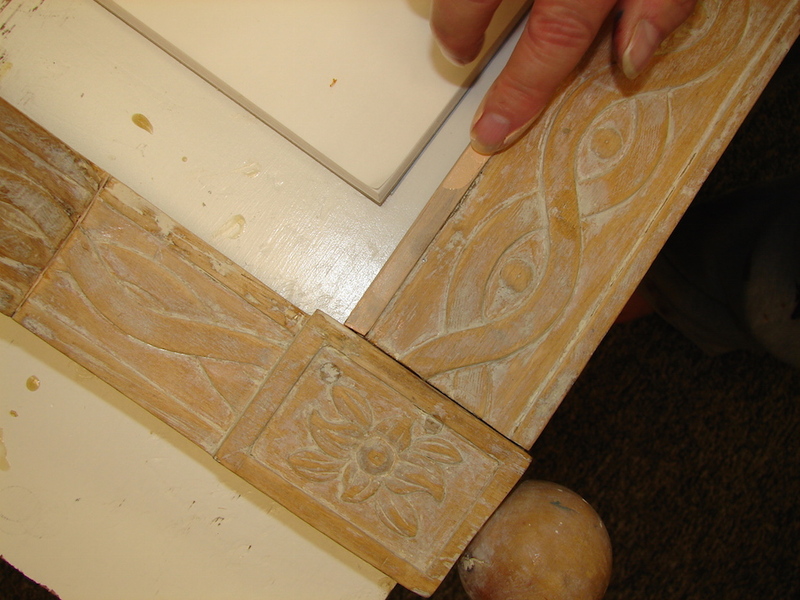 then rubbed again to achieve a buffed appearance (bottom final images). Pearwood color with the olive green next to it. I keep notes on every client’s finish in case I need to reproduce the finish. The state of the finish after excavation and frame repair. You can see the finish was extremely loose and dropped off. The two coats of paint brought it to this point. 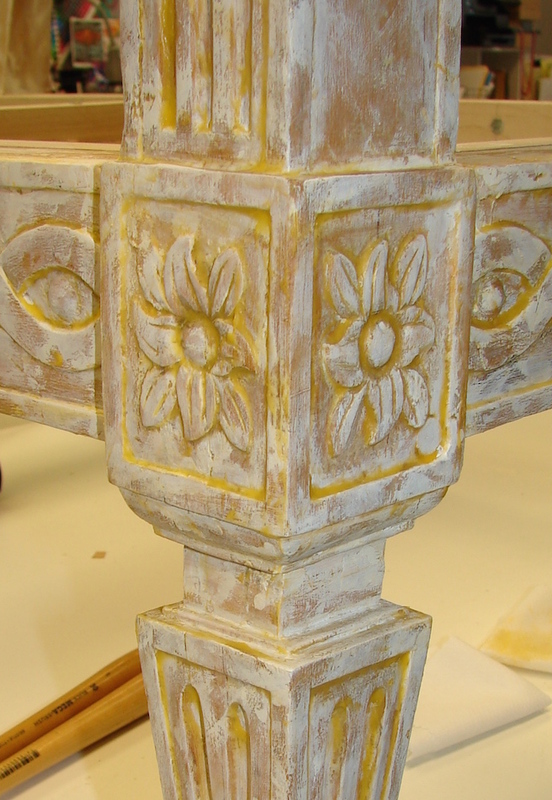 Slightly yellow tinged wax was applied, which greatly influenced and enhanced the colors. After the wax set, it was brushed off selectively to leave the finished finish. Last glance — and a glimpse of the upholstery coming. 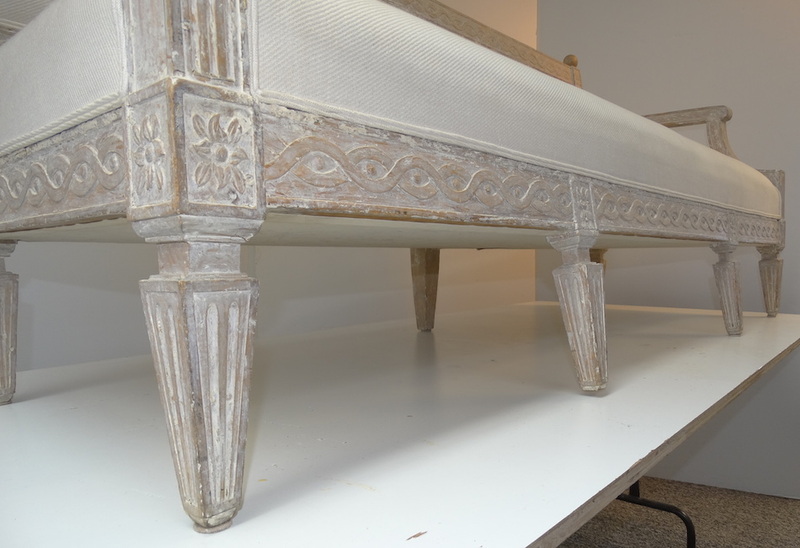 This entry was posted in antiques, decorative motifs, painted furniture, pigments, restoration techniques, waxes, wooden objects and tagged European Pearwood, French Empire, Gamblin Oil Paint, Louis XVI, painted finish, painted furniture, random finishes, shabby chic, sofa. Bookmark the permalink. What do I do when I am not playing with watercolors, you ask? I’m not retired! I work full time! This is the other me, where I work with my husband Mitchell on antiques. This is a different kind of project for me though, in that we are not repairing original shellac or cleaning an oil finish, but trying to replicate a new-old finish the client likes on her antique. Not so easy. It is easier to repair/preserve a truly old shellac. I thought my paint-readers would enjoy it. Cheers!